The views are what attract most hikers to this 40-ace preserve but the flora can be fascinating. In the spring, the forest is covered by vast swaths of wildflowers such as trillium and columbine. In the fall hardwoods create a colorful canopy above the trail. The trails at Whaleback can be combined for a 1.6-mile hike from the trailhead just off M-22. The distances are short but the climb up to the top of the bluff is steady, making the natural area a moderately challenging outing. On USGS topographical maps Leelanau County’s most noted geographical landmark is labeled Carp River Point. To everybody else the distinctive point that juts into Lake Michigan just south of Leland is not a carp but a whale. Whaleback catches the attention of anyone scanning Lake Michigan from afar. To many the distinctive ridge looks like a beached whale, one they can spot standing in Leland’s Fishtown, on a high point in northern Leelanau County or from several beaches in the area, particularly Good Harbor Bay which the point encloses to the north. Encompassing 117 acres and 3700 feet of lakeshore, Whaleback's bluffs tower 300 feet above Lake Michigan and has long been used by sailors as a point of reference. This whale is actually a moraine. Formed by a glacier 11,000 years ago, Whaleback is, in geologist terms, a “drumlin,” a long, oval mound of glacial drift that was molded in the same direction as the original flow of ice. What was left behind was a geologic wonder with spectacular views from the edge of its steep-sided ridge and a terrain supporting a variety of plants and wildlife, all within easy walking distance from one of Northern Michigan’s most popular tourist towns. Whaleback had to be preserved. 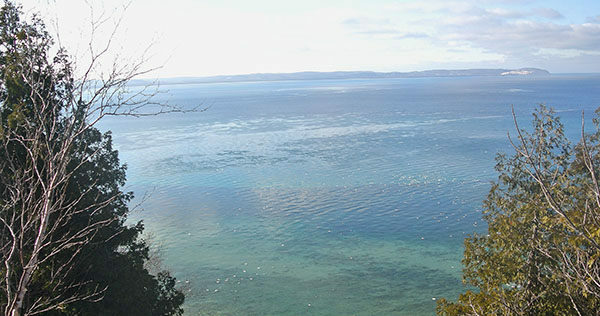 In 1996, the Leelanau Conservancy completed the task when it raised $850,000 to acquire 40 acres of the coastal bluff and the rocky beach at the base of it. Whaleback Natural Area was open to the public after the conservancy worked with surrounding landowners to develop a trail across private property to its newest preserve. The natural area is small and the trail system limited, not much more than a mile of paths. The views are what attract most hikers to Whaleback but the flora can be fascinating. In the spring, the forest is covered by vast swaths of wildflowers such as trillium and columbine. In the fall hardwoods create a colorful canopy above the trail. 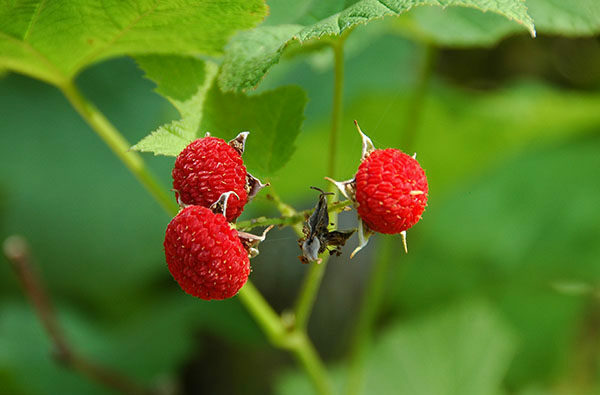 Whaleback’s most unusual resident is the thimbleberry, a large raspberry-like fruit that is common along Lake Superior in the western Upper Peninsula but rarely seen in the Lower Peninsula. 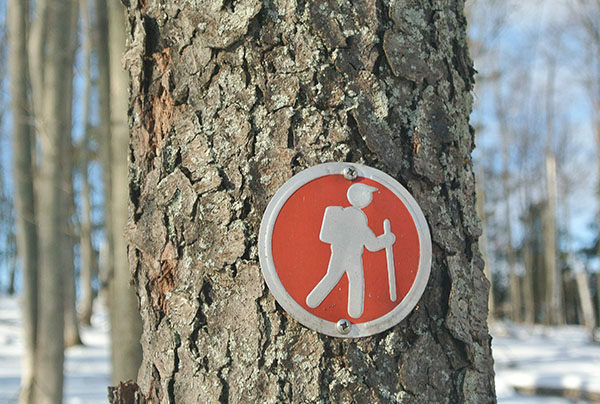 The trails at Whaleback can be combined for a 1.6-mile hike from the trailhead just off M-22. The distances are short but the climb up to the top of the bluff is steady, making the natural area a moderately challenging outing. Glacier Hill Trail, the access trail, enters the woods and begins its steady upward march. It’s not steep but it is a continuous climb of almost a half mile. The access trail passes through private property for a third of a mile before entering the preserve, so it is important to stay on the designated path during that stretch. Within a quarter mile is a bench overlooking a vineyard, a pleasant place to take a break. A sign indicates you have entered the natural area, followed by a junction of the return of Manitou Lookout Loop (stay left) and then views of Lake Michigan through the trees before you reach the short spur to the observation deck. Reached at Mile 0.5, the platform is perched on the edge of the glacial moraine and equipped with benches. 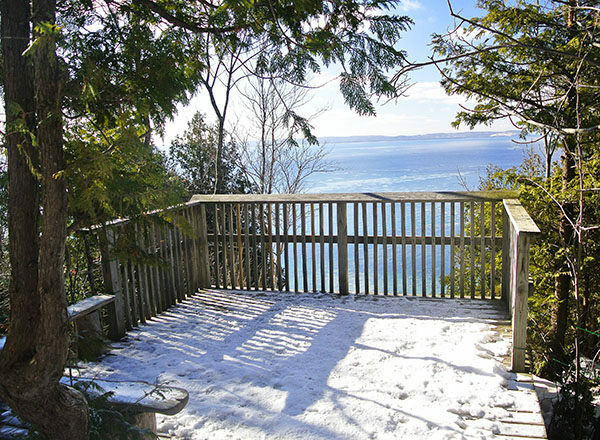 For the price of a climb, you’re rewarded a spectacular view of the green-blue waters of Good Harbor Bay below, Pyramid Point due west and the Manitou Islands on the horizon. The main trail continues to hug the edge of the bluff, providing glimpses of Lake Michigan through the trees. Continuing in a northerly direction, it’s along this stretch that those with sharp eyes will spot the patches of thimbleberries. Two junctions are passed within a quarter mile (stay left) before the trail descends to a point reached at Mile 0.8. Here is a view of the shoreline leading to the village of Leland, Lake Leelanau and a sign that reads “Private Beyond,” reminding you how small the natural area is. The loop known as Birch Valley Trail swings south and passes a posted junction with a private trail that descends a ravine off the bluff. The conservancy trail heads right. You backtrack briefly and then head left at the junction of Manitou Lookout Loop passed earlier to arrive at Glacier Hill Trail at Mile 1.2. Backtrack the access trail, a much more enjoyable walk the second time around, heading downhill to the trailhead. At the trailhead there is parking for a handful of cars and an information kiosk. Whaleback Natural Area is open year-round but in the winter the preserve is a better destination for snowshoeing than backcountry skiing as the incline in beginning has most skiers looking elsewhere. From the junction of M-22 and M-204 head north on M-22 north for a mile. A natural area sign on the west (left) side of M-22 marks where a gravel private drive leads 200 yards west to the Whaleback trailhead and parking area. Whaleback is less than 1.5 miles from the heart of Leland but if driving from that direction the Leelanau Conservancy sign can be difficult to spot. For more information contact the Leelanau Conservancy (231-256-9669; leelanauconservancy.org/). The conservancy also has an office in Leland at 105 North First St. that is open Monday through Friday from 8:30 a.m. to 5 p.m. For lodging or travel information contact Traverse City Tourism (800-872-8377; www.traversecity.com).